Once again Opera Parallèle, that unique and valuable company founded and directed by Artistic Director and Conductor Nicole Paiement and Creative Director Brian Staffenbiel, showed us the relevance of opera to contemporary life. Not through reworkings of traditional opera but through the active writing and producing of new opera. For several years, Opera Parallèle has developed an educational program that offers multiple opportunities for school children – from attending rehearsals to performing opera. The most impressive and innovative of these is their Hands-On-Opera program, in which company staff and professionals partner with students in an intensive eight-week residency, during which the students experience the process of making opera. 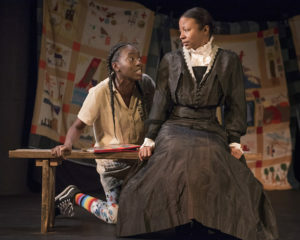 Christabel Nunoo as Modesty and Tiffany Austin as Harriet Tubman in Opera Parallèle’s production of “Harriet’s Spirit.” Photo by Steve DiBartolomeo. 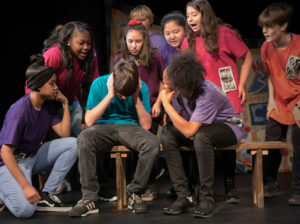 This year the middle-school students of Rooftop Alternative School in San Francisco performed a world premiere production featuring an original score by Bay Area jazz great Marcus Shelby. The libretto by soprano Roma Olvera, who is the company’s Educational Director, tells the story of a middle-school girl, Modesty, and how, when inspired by Civil War legend Harriet Tubman, she is able to overcome deplorable acts of bullying and aggression by her schoolmates. The students of Rooftop Alternative School in Opera Parallèle’s production of “Harriet’s Spirit.” Photo by Steve DiBartolomeo. In a remarkable post-performance conversation with the cast, Director Erin Neff talked about her memories of experiencing bullying as a child and how terrifying that was. She also talked about how difficult it was for the student performers to portray bullies, and to act cruelly to one another in a public platform. There is a pragmatic point in the opera’s story, however: it offers advice alongside Tubman’s role model of exemplary bravery. “How did you do it?” Modesty asks. “Never feel alone,” offers Tubman. Your friends and family are there, willing you to be strong. Putting together an opera in eight weeks, even a 45-minute one, is a miracle of faith and hard work. The most surprising event in the residency for composer Shelby was the students’ trust in the process. He described the students surviving the repetitions of rehearsal, the demanding focus, the need to sit still and to work on moments in the opera out of context – all of which challenged them and which they faced with complete acceptance.